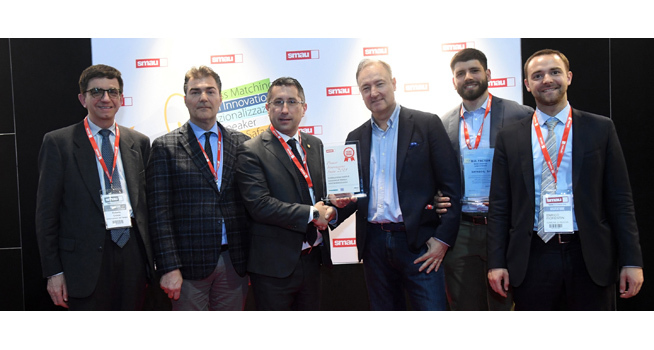 After winning the Premio Innovazione Smau in 2016 for the company’s Digital Transformation project, Stevanato Group has received the Premio Innovazione 2019 on March 29 for their “SYN Here” project. Having access to all the useful information of an infrastructure in a single digital platform, in real time; “SYN Here” is the intelligent platform able to make available the information capital that until now has not been exploited, mapping spaces and objects of the plants that become an active and interactive part of company information processes. A dense network of beacons – bluetooth devices capable of transmitting and receiving small messages within short distances – allows the plant to be mapped and represents the physical basis used to retrieve useful information, transmitted and combined in a single dashboard in real time. Through a geographical layer like Google Maps it is possible to map the infrastructure up to the specific locations in all floor plans, describing the spaces, internal and external, with attributes belonging to compliance, safety or other specific needs: all the available material allows for the creation of a digital model, a virtual twin of the plant. “The model that inspired us was a control room used for managing an important international event. The goal of our platform is to be able to manage all the information of our plant through the geolocation of all the areas and opening the system to solutions coming from other partners,” said Nicola Gianese, iDigital & IT Director, Stevanato Group. From this control room, in fact, it was possible to manage all the situations and criticalities of the exhibition site: from the real-time notification of a device malfunction at one point of the site, which was immediately recorded, mapped and for which assistance was sent, to the monitoring of the influx of visitors by zones, so as to move the staff accordingly. Developed in collaboration with Datasoil, an innovative startup, and the Universities of Venice and Padua, “SYN Here” is designed to host the functionality of any additional partner. The project earned Datasoil the first prize of the local edition of the BUL FACTOR Award – Ultra-Large Bandwidth, by the Chamber of Commerce of Padua. For more information about Stevanato Group: www.stevanatogroup.com.